The Document Categories widget is used to display links to document categories. You can use it to show all document categories, or to show the children of a specific category by providing the category’s ID, its slug or its name. You can also show the children for the current category. Use these options to fine-tune how the document category links should be shown. Title – Indicate a title to be shown above the category links here or leave it empty to show none. Children of … – Leave this empty to show all document categories. Provide a category’s ID, slug or name to show children of that category. Depth – The depth determines how many sublevels of document categories are included. 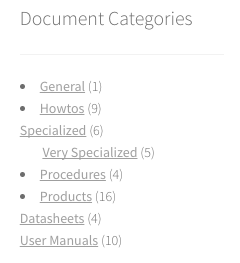 Hide empty categories – This will omit any category without any related documents. Hierarchical – This will be used to show a flat list when disabled or a tree when enabled. Order by … – Use this to determine the ordering criteria. Sort order – Whether ascending or descending order is used. Show count – Determines if the number of documents within each category is shown.